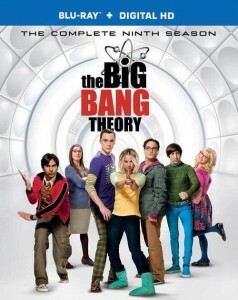 The Big Bang Theory Season Nine DVD and Blu-ray this September in the United States and Canada. The three-disc DVD and two-disc Blu-ray boxsets will be released on Tuesday, September 13. The box-sets will include all twenty-four episodes from The Big Bang Theory's latest season. New bonus features include: "The Big Bang Theory Gives Back", "BBT: The Big 200", "Love IS Rocket Science", "#Just Ask BBT: If I Had To Go To Mars...", "#Just Ask BBT: Who Will Get The Couch? ", "2015 Comic-Con Panel" featurettes, and a Gag Reel. In the United Kingdom and Ireland, Season 9 will be released on DVD and Blu-ray on Monday, August 29. A Seasons 1-9 DVD boxset will also be released alongside a Seasons 1-9 Blu-ray boxset. In Australia, The Big Bang Theory: Season 9 will be released on DVD and Blu-ray on Wednesday, August 31.